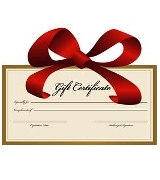 Gift Certificates - Our Gift Certificates are perfect for holidays, birthdays, graduations, weddings and all other special occasions. We will send a physical gift card to you or to the person you are selecting the gift card for. All our Gift Certificates come with a code, so they can be redeemed in person, over the phone or on line.